Have you ever considered cork flooring as an option in your home? If you're in the market for floors and want something a bit special or something different, than cork is the best option for the ideas you're looking for. Cork is extremely environmental friendly, renewable, sustainable material and can say “a multitude of green characteristics”. Regardless to its looks, cork is durable and has several unique positive advantages that make your home more comfortable and healthier and of course a great alternative to other popular options. Comfort- As cork is a natural product; it enriches any interior décor and provides extreme comfort to one’s family. It is a naturally sound and thermal insulator. Cork floors are quiet, incredibly presents comfortable underfoot and pleasant to the touch. It provides a warm surface in cold winter mornings. It makes an ideal for soundproofing of up and down stairs. If looking for a hard surface without noise in your home, then cork is tough to beat. Safety- Corks are trusted floors that do not absorb or accumulates dust and resistant to bacteria or fungus. They do not cause allergies nor pose a risk to asthma sufferers. Adhesives and finishing products used in cork floors are not detectable. 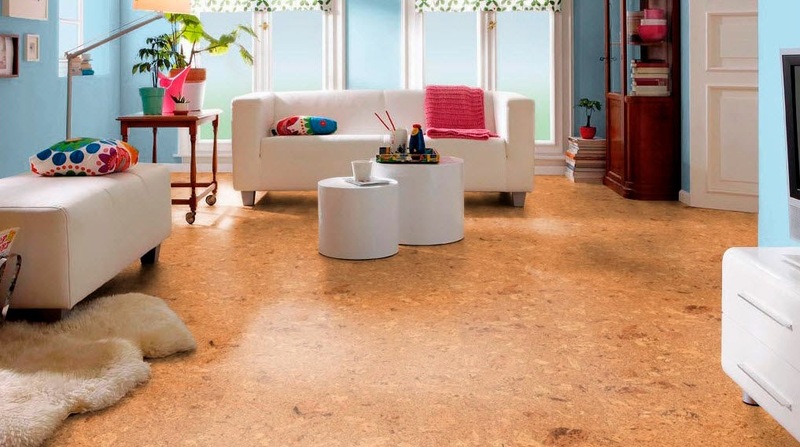 Price- Cork is less expensive and with other benefits, will give you more value for your budget than any other type of flooring. Water Resistant- One of the great benefits of cork is that it’s naturally water-resistant. It does mean it will not get damaged by spills like other surfaces do. Cork is perfect for areas like kitchens, bathrooms and basements. Durability & Easy Maintenance- Cork flooring's are highly resistant and give a long-term protection even in high traffic areas. If the cork is covered with polyurethane or a wax coating can provide a wear surface to your flooring that increases its durability and longevity. No floor is indestructible without proper care and maintenance and will be same with cork as well. Regular sweeping or vacuuming and damp mopping will keep your floors new for ages. Like any floor, even cork is also susceptible to damage if it’s not swept or vacuumed regularly. For longevity and durability remember to consider characteristics like surface finish and material density when balancing cost vs. quality. While price is always a key decision in choosing a best floor, then cork is the best flooring option providing an added value to your home.